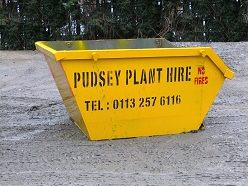 Quick, reliable skip hire from a friendly local family business established in 1966.
or click here to view a full price list. W: 4'7" x L 6'3" x H 2'11"
W: 5'7" x L 8'2" x H 2'11"
W: 5'3" x L 7'3" x H 5'1"
W: 5'11" x L 11' x H 4'2"
W: 5'11" x L 14'1" x H 7'7"
Please note: Jumbo skips have a larger volume but cannot be filled with heavy material as they have the same weight capacity as a maxi skip. 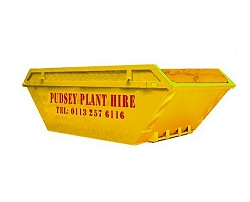 Established in 1966 Pudsey Plant Hire were one of the pioneering companies to provide skip hire in West Yorkshire. Today we still offer that same day service. All our wagons have two way radio contact enabling us to achieve fast service. We are a Registered Waste Carrier - WYK 887562 - which ensures you have a full waste audit where your waste has been disposed. Our accounts system is fully computerised and we can offer full in-depth audit of any particular site, which is especially beneficial for skip movements. 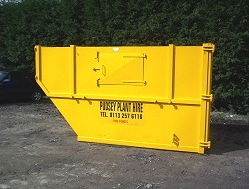 The cost of the skip depends on the size of the skip, your location and where the skip will be placed. Our online booking system will calculate the price for you before you make the booking. What can't I put in a skip? We cannot accept asbestos, fridges, freezers, tyres or gas cylinders. Mattresses can be disposed of in the skip. However only one mattress per skip. Any additional mattresses will be charged at £7.50 per mattress. How long can I keep the skip for? 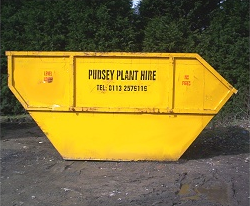 The hire period for our skips is 1 week and a weekly rental will be charged for longer periods of hire.Please contact us if you require a longer hire period. You can pay with a credit or debit card using our secure payment facilities. You will require a local authority permit if you would like to put a skip in a public area such as a grass verge or on a road. We will arrange this and add the fee to your booking. If you have advised us that your skip will be on private land but our driver find he has to put it on a road then we will add the permit fee onto your price. How much can I put in a skip? Please only fill a skip up to its brim. Overloading a skip or making the skip bigger using boards will exceed our safety guidelines and we reserve the right to refuse dangerously overloaded skips. Can I have a skip today? 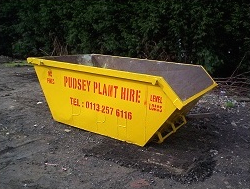 All our skips are subject to availability so if you require same day service please contact us. Same day delivery is usually available but can only be guaranteed if booked before 8am. Please note we are closed on Sundays. 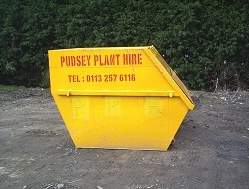 Any damage to a skip whilst on site e.g. by burning will be chargeable to the customer. Any damage to hirer's property occurring whilst on or off loading skips is the hirer's responsibility. This includes manhole covers, gates, gateposts, flagstones etc.